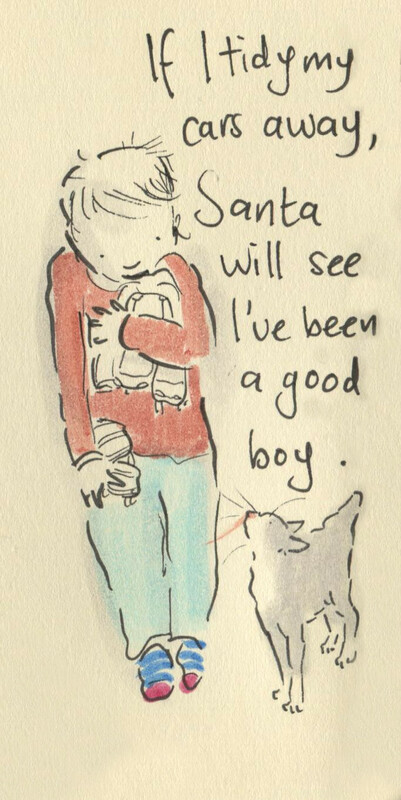 Posted on December 23, 2013, in Uncategorized and tagged Children, Christmas, Doodlemum, Drawing, Family, Humour, Illustration, Life, Pen and Ink, Sketchbook. Bookmark the permalink. 3 Comments. Lol. Yes, there’s been of that going on over here too. It’s best not to trip Santa up, he might not be so steady on his feet tonight! Are all the children better now? I wish you all a happy Christmas, and peaceful thoughts to you all. Get everyone ( including you and Myles) into bed early- it will be a long, long day tomorrow! Mind you, it’s worth reminding the children that the reindeers have extra sensitive hearing, and can detect if they’re awake. If so, no pressies, and morning starts at 7am, ( or later) not 4am! This is a very sweet and precious drawing. Beautiful.